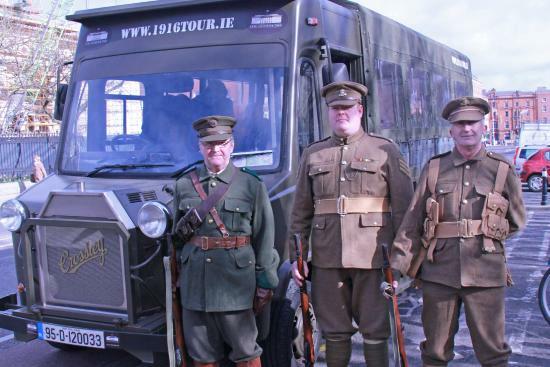 1916 Easter Rising Tour - thank you to the PA!! 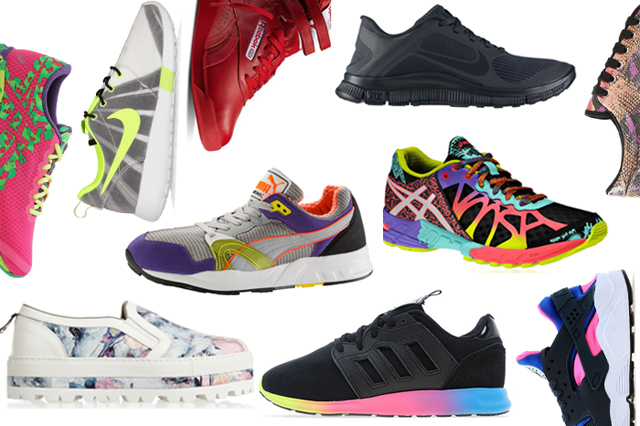 Get Moving - It's Active School Week!!! Get ready for Active School Week!!! Wednesday: Style Your Scooter & Bling Your Bike! At 9.30 am on Monday morning, 6th Class led the senior side of the school on a 'Walk a Mile with a Smile'. It took us 39 minutes to complete. We walked along Cross Avenue past Blackrock College and Sion Hill, then we turned left onto Mount Merrion Avenue, then left again onto the Rock Road, past Blackrock Park, Bernadette's house, Blackrock Clinic, Caroline's house and Blackrock College and Willow Park. We kept walking along the path past Firehouse and turned up Booterstown Avenue at the Punchbowl. We passed by Gleeson's and finally crossed back to our school and home sweet home! We will be performing our mini-musical on Tuesday 28th June at 1pm. Moms, dads and other relations are welcome! If you can't make it on Tuesday, we will be showing it to the rest of the school on Friday 24th June at 11am and you might be free to see it then! 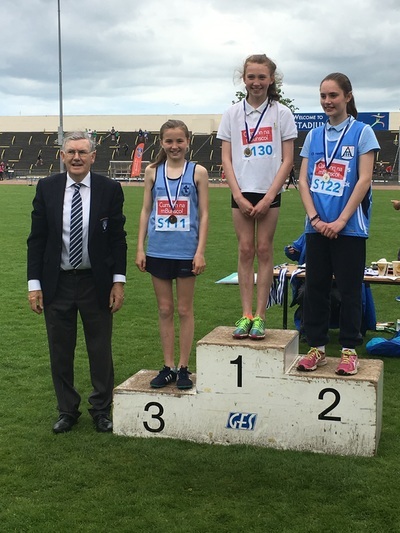 Well done to the 6th Class girls who took part in the Cumann na mBunscoil athletics events in Morton Stadium, Santry. Aisling and Alex competed in the 600m. Rachel competed in the hurdles and Caroline was on standby as a sub. Lucy competed in the high jump. Evanna was also due to compete in Santry but, Unfortunately, she had an accident a few days before the event and her arm was in a cast. She went to cheer on her classmates, however, and we even had a bronze medal winner for our school. Fantastic!! For a number of weeks, 6th Class were invited to go to the driving range at Leopardstown Golf Club. For some girls, this let them practice their skills but for others it was a chance to begin to play golf. A huge thank you to Ms. Henry and especially to Rachel's dad, Stephen, who helped to arrange these evenings. Thanks also to the other moms and dads who helped us while we were up there - Brian Schwer, Conor O'Brien, Caitríona Fottrel, Luke Griffin and Conor Hoey. We entered the Primary Schools' Golf Competition in the Castle Golf Club, Rathfarnham. Caroline, Rachel, Rachel and Lucy represented our school. They had a very early start as they had to be there at 7.20 am and on the first tee-box at 8.15am. 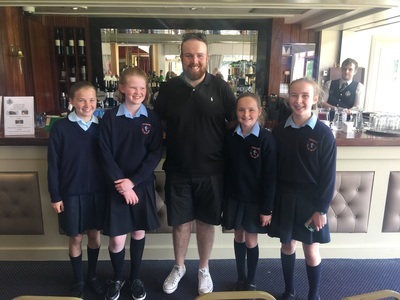 It was a tough competition but they had a great day and got to meet Shane Lowry, who won the World Golf Championships in August. He has also won the Irish Open three times as an amateur. In June, all the girls who attended the weekly lessons will be invited to play golf against St. Mary's 5th and 6th Classes in Leopardstown. Last year it was very tight but St. Mary's won, so hopefully this year it will be our turn! Our Handwriting Winners - Well Done! Just after the Easter holidays, 5th and 6th Classes went on a trip to the city centre. We went on the wonderful 1916 Freedom Tour. It was really great. Our guide was dressed up in military costume and we traveled around all the important places in Dublin that related to the Rising. We also got to try on the Volunteers' helmet and a helmet of a British soldier. We held the guns too.. We stopped in different places and sometimes got off the bus at different venues. The bus also had a television screen so we could see Dublin of 1916 as we looked out the window at Dublin 2016. It was a great day. Thanks to the PA who sponsored this tour for us. On the Tuesday following our Confirmation, the whole class came into school wearing their Confirmation clothes for the day. We got our photographs taken separately in our Confirmation outfits and then together in our albs. We then went in groups around the school showing our outfits and telling our experiences to the classes and teachers. Later we went outside and took pictures with each other and one big class photo. In all it was a fun-filled day and we had a great time. We celebrated our Confirmation on Friday 22nd April 2016 with the 6th Class boys of St. Mary's BNS. Our celebrant was Msgr. Lorcan O'Brien, accompanied by Fr. Cormac and Msgr. Conway. The ceremony started with seven banners representing the seven Gifts of the Holy Spirit. We then had the opening procession and were welcomed by Mgsr. O'Brien. Next, John did a reading and Ava, Ayla, Daniel, Emmett, Fiona and James sang the responsorial psalm. After that, Msgr. O'Brien talked for a while to us about the gifts and the fruits of the Holy Spirit. When the homily concluded we renewed our Baptismal vows and we sang 'Confirm Us Today'. Then all the Confirmation candidates went with their sponsors to the altar in order to get confirmed. Mgsr. O'Brien was very good-natured and had a brief chat with all of us about our Confirmation names. Shortly after we received Communion Conor, Jennifer and Leanne read out a poem by Mother Teresa called 'Anyway'. When the ceremony was over, some of us took photos with Msgr. O'Brien, our friends, family and teachers, In all, the day was very spiritual and uplifting. On the Sunday, most of the class went to Leisureplex to go bowling and play Quasar. We all had such fun and it was a very memorable day. Sophie in our class came up with the brilliant idea of doing a book club. Everyone thought it was a good idea and so we split up into five groups. We chose the genre of war and picked one book for each group to read. 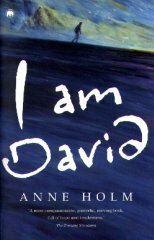 The books we chose were Carrie's War, War Horse, The Boy in the Striped Pyjamas, Goodnight Mr. Tom and I Am David. We had three weeks to read the book and when this time was up we met and discussed what we liked and disliked about the books. We really enjoyed the experience and it has encouraged us to read other books. 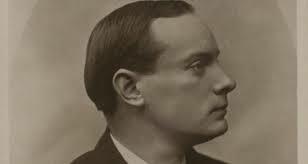 "We serve neither king nor kaiser"
Pádraig Pearse - always in profile because of his bad eye. We had learned about the 1916 Easter Rising in October when we were presented with our copy of the Proclamation and an Irish flag by members of the Irish Army. But now that the centenary is here we have done some more study on this period. We also read a book based on children growing up during the Rising, called 'Friend or Foe'. It was written by Brian Gallagher. In the story Emer's and Jack's parents are on opposite sides. 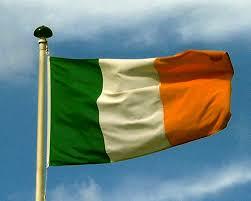 Emer's father is a Fenian and Jack's father is a member of the Dublin Metropolitan Police. We really enjoyed the book - there was a lot of build-up and excitement and a great climax near the end. Hopefully Brian Gallagher will come to visit us during Book Week and he could tell us about his job as a writer. We knitted and knitted and knitted and asked our families to help us knit Easter chicks. Christina found a pattern to make Easter bunnies so we made these too,. We also halved the number of stitches to make baby chicks and bunnies. Instead of putting a Creme Egg inside the mini chicks, we we put a mint inside and sold it for €1 instead of €2. These mini-chicks proved very popular. Again, all the money raised will go to our two charities. We recently went to visit Glasnevin Cemetary on 17th February 2015. Our tour guide, Cathy, showed us the graves of many famous figures, such as Daniel O'Connell, Charles Stuart Parnell, Eamon de Valera, Michael Colliins, Kitty Kiernan, Constance Markievicz and Elizabeth O'Farrell. We learned a lot of new things during the trip, including about the mysterious French lady who often places flowers on Michael Collins' grave. As it was soon after St. Valentine's Day, she had left a special bouquet of flowers on his grave with a card. We finished off our trip by taking a quick visit to the Botanic Gardens. We saw lots of beautiful flowers and plants, a model of a Viking house and we took a walk through the Palm House where we experienced rainforest-like weather which suited the plants that were kept there. We also watched the documentary film 'One Million Dubliners' which gave an inside view into life and death in the cemetery. It got its name from the one million people who are buried there. It was a great film - very interesting and a little bit sad too. Some tears were shed in our class as we watched the end. We received ashes from Fr. 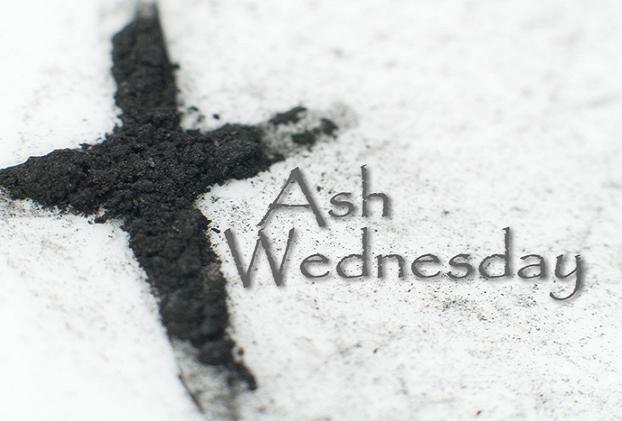 Cormac to mark Ash Wednesday and the beginning of Lent. The ashes come from the burnt palms in the church for last year's Palm Sunday celebration. Fr. Cormac said "Repent and believe the Good News" as he gave us the ashes. Everyone made a pancake mixture at home and brought it in. We also brought in our choice of delicious toppings such as chocolatey goodness, Nutella, whipped cream and ice-cream. Ms, Plunkett helped us to cook the pancakes and we made a yummy scrummy pancake each! Our Service of Light and Commitment was on the 2nd February 2016. It was all about the symbol of light. Our parents lit our baptismal candle and passed it on to us. We then renewed our baptismal promises. We are now becoming adults in the eyes of the Church and now it is our duty to continue our faith journey. We are Not the Centre of the Universe! It's very humbling, yet fascinating and maybe also a little bit exciting to realise just how small we are in comparison to the universe. We had planned to play one Christmas carol on the tin whistle at assembly on our last day of school before the Christmas holidays, but we soon found that we had learned enough tunes to perform a concert! We invited our parents and relations to come to hear us play and to get everyone into the Christmas spirit. 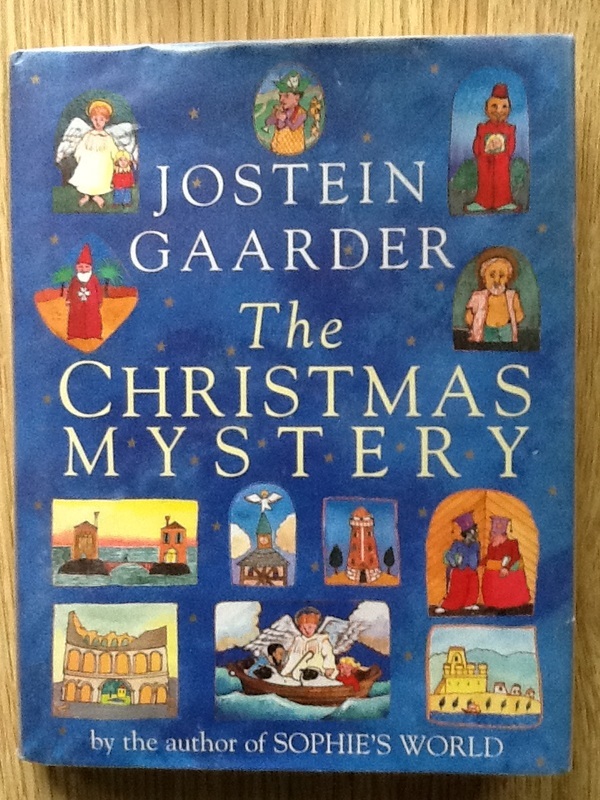 In school we read a book called 'The Christmas Mystery' by Jostein Gaarder. 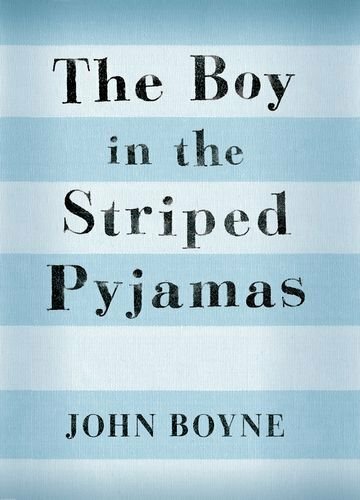 The book was originally written in Norwegian but it was later translated to English. 'The Christmas Mystery' is about a boy called Joachim who goes out one day to buy an advent calendar with his father. They go into a book shop and and old one all by itself catches his eye. The owner of the bookshop says that it was left by a strange man called John. On the first day of Advent, Joachim opens the calendar and discovers that it is no ordinary Advent calendar. This Advent calendar tells the story of a little girl called Elizabet. There is a mystery to be discovered and every day brings Joachim deeper and deeper into it. The class really enjoyed the book and it put us in the Christmas spirit. Rang VI from St. Mary's invited Rang VI from Our Lady of Mercy to their school for a social gathering after the inter-schools Christmas carol service. They treated us to cakes and buns and then we played a game of football in the yard. 6th Class invited pupils in the school to donate a cut-out of their hand print in order to put together and grow a special 'Hands Together' tree. We collected a €2 donation from people who wished to contribute their hand and the money will all go to our two 6th Class charities. You can see from the pictures how the tree grew as we glued hands to make the leaves. The end result was displayed in the hall after the Christmas carol service for all to see and we raised over €200 for our charities. which was great. In November, we remember those who died in the first World War and other wars. We studied World War I and learned about life in the trenches. It was not a nice place to be. Some girls made and wore poppies for Armstice Day on 11th November in remembrance of the date on which World War I ("the war to end all wars") ended. 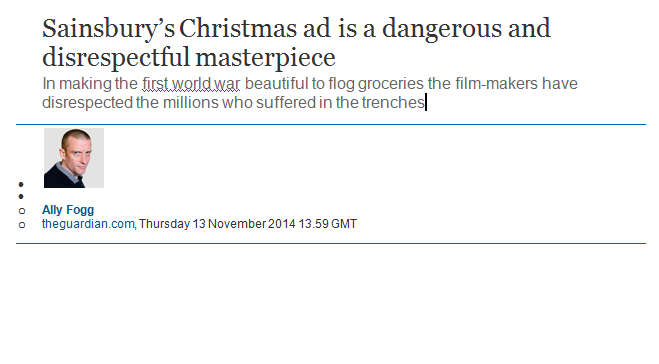 Ally Fogg believes that the advert romanticises life in the trenches and it actually disrespects the soldiers as life in the trenches was horrific. We had a class discussion and wrote about our views. Some agree with Ally Fogg, Others disagree but we could all see that both sides had a good point. What do you think? Ghléasamar suas i gcóir Oíche Shamhna ! 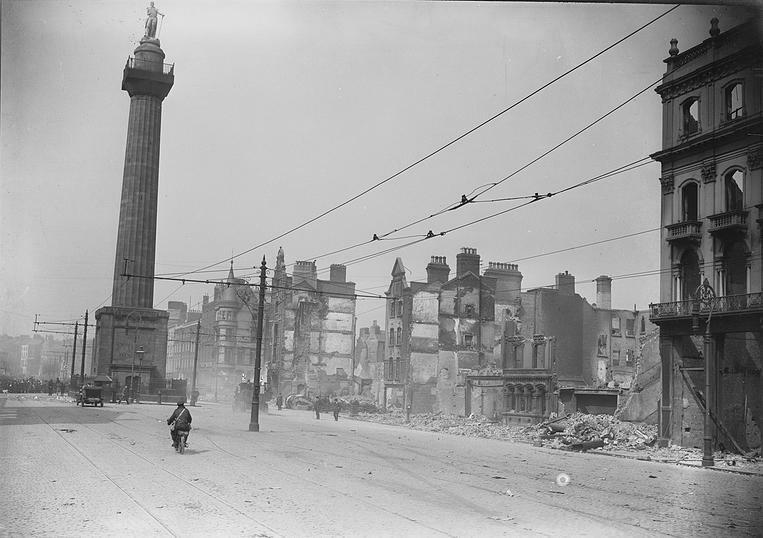 2016 is the anniversary of the 1916 Rising. 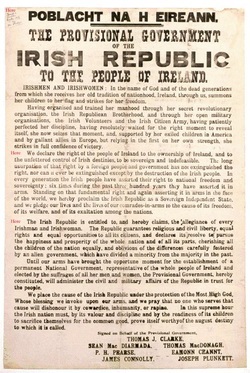 Every national school will be presented with the Proclamation and an Irish flag. On 21st October 2015 two men from the Irish Army came to our school to present the Proclamation and flag to us. 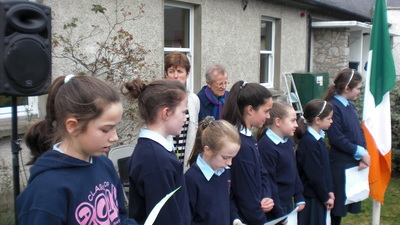 Sixth Class made a guard of honour to welcome them. Rachel accepted the flag and Lucy accepted the Proclamation on behalf of the school. Aisling read a part of the Proclamation along with the military men. We learned the national anthem, Amhrán na bhFiann, and have been learning about the Easter Rising and its important leaders, such as Padraig Pearse and James Connelly. We made a huge time-line of the lead-up to the Rising, each day of the Rising and the importance of the Rising today. 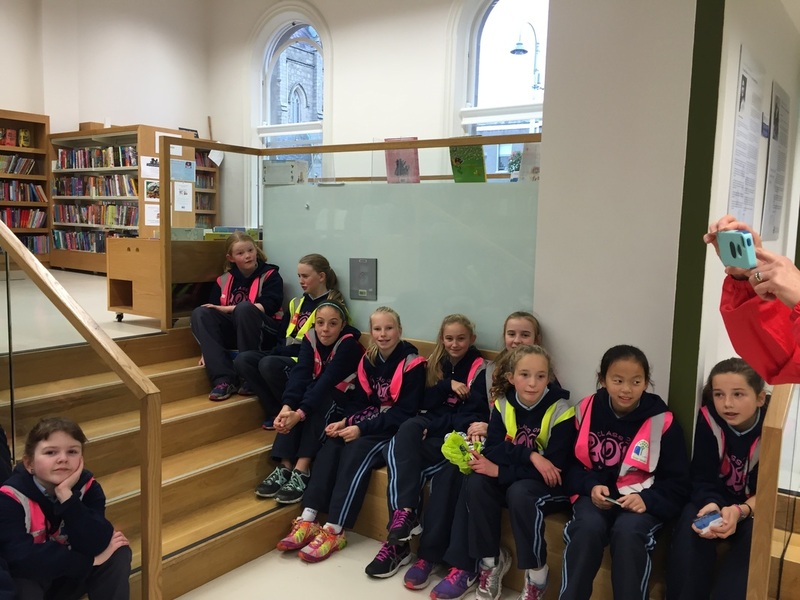 On Wednesday 14th October, our class walked to Blackrock Library through Blackrock Park. We were taught about the library's history. 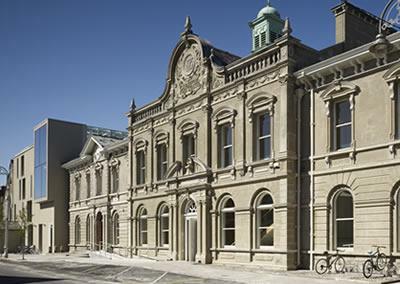 Andrew Carnegie, a philanthropist, donated money to build this library as well as many other libraries in Ireland, Scotland and America. Some of the class didn't have a library card and got one that day. We also did a mini-quiz in the library. We were then shown how to return our books and how to use the self-service kiosk to take out books. You are allowed to take out twelve items per visit. This includes books, CDs, DVDs, books on CD and video games. There is a computer which is available to the public. On the way back, were were lucky because Ms. Quinn let us go into the playground and we really enjoyed it! Look at the beautiful autumnal colours in Millais' painting. We all had turns in the hall and had a great time playing mathematical games, including iPads, Nintendos, Jenga and others. We also loved giving the the little Bee-Bot robot directions! Each class had a maths trail to do around the school grounds. Here are some of the questions from our trail...How many windows in the front of the senior side of the school? How many cars are parked in the staff car park? When was the Wildlife Garden officially opened? We were also lucky to have three dads visit us during the week to give us special Maths Week classes on an aspect of maths. A massive thank you to Stephen Gillmor, Alan Barry and Duncan Graham. It was a very fun week! We did a Jenga domino! - Mr. Gillmor, Mr. Barry & Mr. Graham! Stand Up for Primary Education! aIn the lead up to Budget Day, which was 13th October, 6th Class organised colourful posters and signs around the school. On Budget Day, the government announces how they will share the country's money. Teachers, pupils and parents want them to remember to give a fair share of money to primary education and the posters say 'Stand Up for Primary Education!'. - email our government politicians, Mary Mitchell O'Connor (Fine Gael) and Eamon Gilmore (Labour). Thankfully there were no cuts to primary education and thanks to everyone who contacted their local TDs. 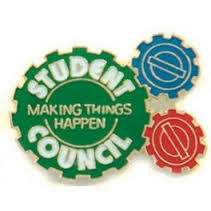 The Student Council elections took place this week. Five people from 6th Class put their names forward and gave a speech to the class in the hope of winning votes to represent the class on the Student Council. The representatives elected from 6th Class are Leanne and Lucy. We have just elected the Green School committee members, Christina and Jennifer, for 6th Class. This year our goal is to get the biodiversity flag. This flag will be our fifth flag. For everyone who doesn't know what biodiversity is, it is the life cycle of plants and animals. Biodiversity might not seem that important but if you think about it like a carpet, if one thread is loose, it will affect all the threads around it or could even undo the whole carpet. On the 24th September we celebrate Mercy Day. Mercy Day is a day dedicated to Catherine McAuley and the Mercy congregation. Catherine McAuley was born in Dublin in 1778. When she was young her parents died and left her and her siblings dependent on relatives. In her early twenties, Catherine went to live with an elderly couple and provided companionship as well as managing the household. She noticed much poverty in the area and gave out food and taught the poor children. Later Catherine inherited the old couple's house and sold it to support the local schools. She also bought a site on Baggot Street and built a school and a shelter for homeless women and children. She named it the House of Mercy. After that she studied the French education system. She returned to Ireland and gathered a group of devoted young women to help her to assist the poor. At the ripe old age of 50, Catherine decided to become a nun. The House of Mercy was called the Convent of Mercy and the nuns were called Mercy nuns. There are now a huge number of Mercy schools and hospitals including our school, Our Lady of Mercy Convent School and the hospital we are supporting for our 6th Class charity, Temple Street Children's Hospital. Catherine was also on the Irish £5 note before we switched to the Euro. On 21st September, Being Kind and Caring Week began and it lasted until 25th September. Being Kind and Caring Week is all about trying to be nice to your friends and including instead of excluding people in your games. At the end of the week three girls got certificates at assembly. Every teacher had to keep a close watch on all of their students and see who deserved a certificate (who was being kind and caring). 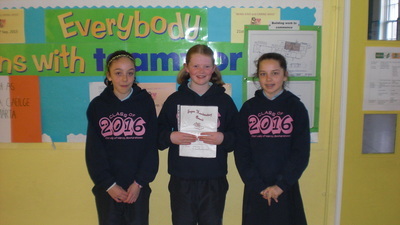 The girls in our class who got the certs were Aisling, Ayla and Rachel O. 6th Class also started helping Junior Infants. Our class went down to Junior Infants on Friday while they were colouring, cutting and pasting. We helped them and had fun! Every year the 6th Class girls choose one charity to support. We also alternate between supporting Temple Street Hospital and Crumlin Hospital. This year we are supporting Focus Ireland and Our Lady's Children's Hospital, Crumlin. Our whole class participates in the fundraising and our first fundraiser is the Garden Party. 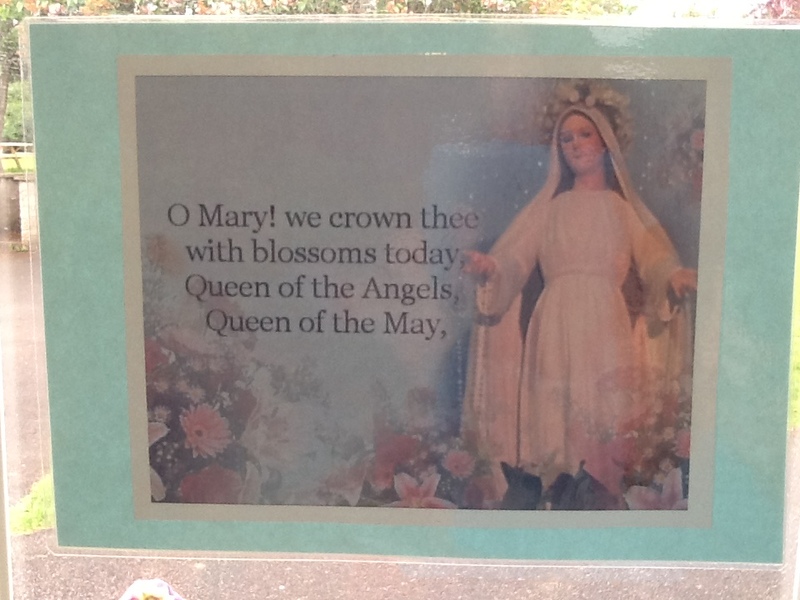 The Our Lady of Mercy annual Garden Party took place on Sunday 20th September 2015. 6th Class spent quite a lot of time getting ready in the week leading up to the party and before the people arrived on the day of the garden party. During September, our class decided on the 6th Class Charities for 2015/2016. It was a very tough decision but in the end we chose Focus Ireland as one of our charities. This year, Focus Ireland has provided approximately 5,000 homes to families around the country. 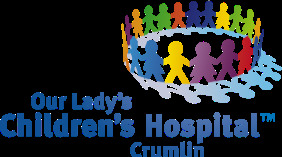 The other charity that we have chosen is Our Lady's Children's Hospital, Crumlin. This hospital cares for sick children. Crumlin Hospital is the largest children's hospital in the whole of Ireland. Both of these are amazing charities ad we are delighted to be donating our money to them. In 6th Class we have a Gratitude Copy. We decorated them with coloured paper and sparkles. In the copies, we write different positive things - Three Things for which I am Grateful, uplifting quotes, Recipe for Happiness, My Three Wishes and much more! We enjoy writing in our Gratitude Copies because it reminds us of everyone we know and love and we will keep this copy with us through secondary school and college.